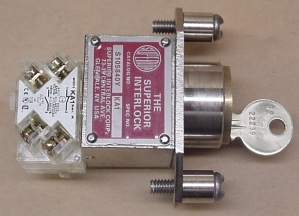 The Superior switch locking unit type B-8003 is a panel mount key-actuated switch designed for sub-panel mounting either flush or protruding ¾". 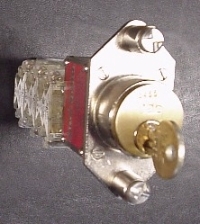 This switch is primarily designed for control circuits, motor controllers, circuit breakers, or any portion of an interlock system that requires a key to send an electrical signal. 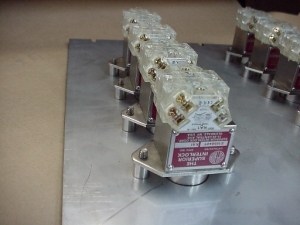 This unit can also be used as a load maker and load breaker switch by paralleling contacts. The maximum contact arrangement available is 8 n.o. and 8 n.c. contacts. 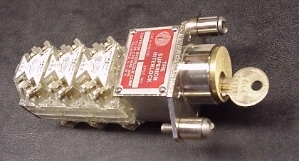 The multiple contact arrangement provides a wide range of switching capabilities. This unit is only available in a single key version. 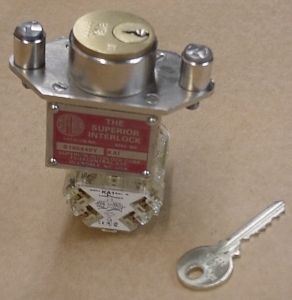 For multi key switch interlocks, please consider the B-4003 type interlock. The B-8003 is available with a dust cover for outdoor use. This unit comes standard with flush panel mount bushings and tamper resistant mounting screws. Please see the catalog cut sheet or contact or factory for details.